But for others, there is the maddening truth; unimaginable horrors lurk in dark places beyond the world we know, horrific things that regard humanity as little more than cattle; insignificant creatures to be used and cast aside at their whim. Ever watchful, they seek to pry open the gates to this realm, to reclaim that which was once theirs. Some so-called enlightened individuals choose to travel the dark paths, seeking to gain knowledge never intended for human eyes, seeking arcane tomes and malefic artifacts in hopes of knowing the unknowable, even at the cost of their sanity. Indeed, at the cost of their very lives. 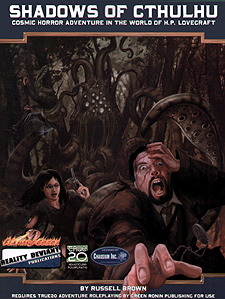 Shadows of Cthulhu makes use of the elegant True20 game system, providing you with everything you need to run a campaign series in deliciously maddening the world inspired by the works of HP Lovecraft.